Thank you for visiting the BRAINS frequently asked questions page. Please see topics and questions below. If you cannot find an answer to your question here, please e-mail us at brains@uw.edu. What is unique about the BRAINS program? BRAINS differs from other programs by providing longitudinal professional development that specifically targets factors known to impact career persistence and decisions of URMs in science. BRAINS emphasizes peer mentoring, community, the intersection of professional and personal development, and experiences as a member of an underrepresented group in neuroscience. Finally, BRAINS not only offers a professional development experience (symposium or webinars), but it also offers follow-up professional development and community building opportunities such as peer mentoring groups. These opportunities foster ongoing connection to the BRAINS community. When is the next round of applications? Application for the 2019 BRAINS cohort are currently being accepted. Visit the Application page to learn more. Applications will be accepted until 9 am PDT on May 20, 2019. What are the BRAINS program pathways? The BRAINS program consists of two cohort-based pathways: Fellows and Affiliates. Both pathways include professional development on a wide variety of career topics such as mentoring, life management, and thriving as a scientists from an underrepresented group in neuroscience. For Fellows, this is in the form of an in-person, four-day national symposium and later a cross-cohort symposium. For Affiliates, this is through an online virtual workshop series. Both the Fellows and Affiliates foster and extend their BRAINS experiences through virtual peer Mentoring Circles with members of their cohort. The Mentoring Circles provide frequent and safe forums in which to discuss concerns and receive constructive feedback, as well as set realistic personal goals. How do you apply to the BRAINS Fellows and Affiliates Pathways? Applicants apply to the BRAINS program using the same application. All eligible applicants will be placed into either the Fellows or Affiliates pathway. How are Fellows and Affiliates selected? BRAINS applications are evaluated using a rubric grounded in our eligibility criteria and program goals. Sample selection criteria include access to networks and mentors, access to professional development resources, scientific potential, interest in academic careers, and connection to NINDS's mission. The Fellows Program prioritizes high potential individuals for whom the program could make the largest differential impact. For example, individuals who may be at risk for leaving science and academia due to a lack of professional support and career self-efficacy may particularly benefit from the Fellows Program. The Affiliates Program serves high potential individuals seeking additional professional development and networks. ​Who is eligible to participate in BRAINS? Early career Ph.D. scientists in neuroscience-related fields who are US citizens or Permanent Residents (unless strongly justified on the basis of exceptional relevance to NIH and approved by our funding agency) and are from underrepresented groups (see below). Early career includes postdoctoral researchers, assistant professors, assistant research professors, and other pre-tenure level science positions. 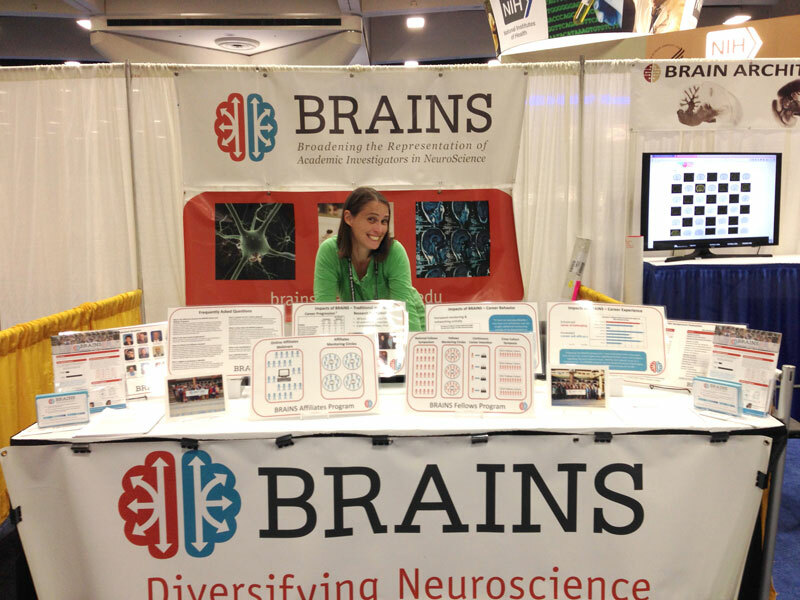 Which underrepresented groups are eligible to participate in BRAINS? BRAINS is funded by NIH with the goal of increasing diversity within the neuroscience workforce on a national basis. Our funding mechanism (PAR-13-256) states "...for this NINDS Diversity R25 program, diversity includes individuals currently underrepresented in neuroscience research on a national basis (for example see the Society for Neuroscience Committee on Neuroscience Departments and Programs surveys), including: individuals from underrepresented racial and ethnic groups or individuals with disabilities...” Eligible racial and ethnic minorities include African Americans, Hispanic Americans, Native Americans, Alaskan Natives, Hawaiian Natives, and natives of the US Pacific Islands. In addition, it is recognized that underrepresentation can vary from setting to setting; individuals from racial or ethnic groups that can be demonstrated convincingly to be underrepresented in their field are also eligible and will be evaluated on a case-by-case basis. Individuals with disabilities (defined as those with physical or mental impairment that substantially limits one or more major life activities) are also eligible for the program. Must I complete my Ph.D. before applying? Given BRAINS' focus on addressing the critical transition period from graduate studies and post-doctoral positions to permanent research and teaching positions, priority will be given to eligible individuals who have earned their doctoral degrees within the past two to twelve years and who do not have tenure. Are Asians considered underrepresented in neuroscience? In general Asians are not considered underrepresented in neuroscience. However, in 2018 NIH issued a Notice on NIH’s Interest in Diversity which recognizes that underrepresentation varies from setting to setting. Therefore, individuals from racial or ethnic groups that can be demonstrated convincingly to be underrepresented within their field, including some Asians, may be considered eligible by NIH. For this R25 funded program, these cases will be evaluated on an applicant-by-applicant basis in partnership with our NINDS program officer. Are women considered underrepresented in neuroscience? Women are not considered to be an underrepresented group in neuroscience at the career stage targeted in this R25 program. However, if you are a US citizen or permanent resident and also a member of one of the underrepresented groups listed in our eligibility section, you are eligible for the program, and we encourage you to apply. Are M.D. neuroscientists eligible to participate in BRAINS? M.D. neuroscientists are certainly eligible to attend BRAINS provided other eligibility criteria are met. However, the program is not structured to address the issues unique to M.D. neuroscientists. Rather, the program content's focus is research-based neuroscientists. When is the next BRAINS Fellows Symposium? The next Fellow Symposium will take place September 12 - 15, 2019 outside of Seattle, WA. Do I need to stay for the entirety of the Fellows symposium? Can I attend for just a single day? Given the community we hope to establish through the BRAINS Fellows symposium, all participants, panelists, and facilitators are required to stay for the duration of the event. The BRAINS symposium model provides for for deeper continuity, discussions, networking, and relationship building. What topics will be addressed at the Fellows symposium? The Fellows Symposium will address professional development topics such as mentoring, research funding, time management, mastering teaching, thriving as a neuroscientist who is a member of a group underrepresented in the field, and other topics. Please note that the Fellows Symposium is not designed to address issues related to applying and interviewing for jobs, although some of the symposium panels and discussion might indirectly touch on these subjects. How will housing be arranged at the symposium? Symposium participants will be assigned a roommate and share a large double room with another BRAINS participant. Accessible rooms will be available as needed. How much does the Fellows symposium cost? The symposium costs (lodging and meals) will be covered by the NIH grant. No registration fee will be charged. Participants will be responsible for travel expenses. I have a nursing infant. Can I bring my infant and a family member to take care of my child while I attend the Fellows Symposium? We certainly empathize with the challenge of combining nursing and travel for work. We've been there ourselves! Nevertheless our experience from the various early-career symposia we have run has made it clear that it would be very difficult for participants to take full advantage of the BRAINS experience if children or other family members attend. Our Symposium program runs from approximately 8 am until 8 pm, with lots of time for networking, conversations, and personal reflection. This program is an opportunity to take time to focus on you and creating the career and life you seek. Thus, participants are not able to bring their family with them. If you are accepted to the symposium but cannot attend due to family constraints, you may defer your acceptance to a future BRAINS symposium. I have a nursing infant. What accommodations are available for pumping? The conference site has a room available to pump breastmilk and a refrigerator/freezer to store the milk. Can someone still apply and be selected for the Fellows Program after having participated in the Affiliates Program? Yes, as long as the individual continues to meet the eligibility criteria. The person will need to submit a new application when there is another open call for applications. How do people get into the Affiliates Program? Interested individuals must submit an application to the BRAINS program during the open application process. All eligible applicants will be invited to either the Fellows Program or the Affiliates Program. What topics will be addressed in the Affiliate virtual workshops? The Affiliates virtual workshops will address professional development topics such as mentoring, time management, thriving as a neuroscientist who is a member of a group underrepresented in the field, and other topics. Please note that the Affiliates program is not designed to address issues related to applying and interviewing for jobs, although these topics may arise during the virtual peer mentoring circle discussions. The BRAINS program is funded by NINDS National Institutes of Health grants R25NS076416 and R25NS094094. The program has received funding from 2011-2021.